The lower Deschutes River. Photo by Amy Hazel. 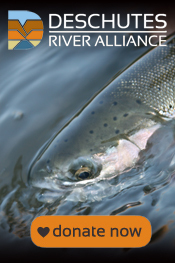 On May 16, 2016, we announced that the Deschutes River Alliance had sent Portland General Electric a sixty-day notice of intent to sue for violations of the Clean Water Act at the Pelton-Round Butte Hydroelectric Complex. Since that time we have received a tremendous outpouring of support, far more than we had anticipated. We are greatly appreciative and want to say thank you. We did not request donations (saving that for a future fundraising effort), but we received many financial contributions to support our efforts. Thank you to those of you who contributed! We also received a lot of feedback from individuals and organizations. All the feedback has been extremely positive, and we’re incredibly grateful. We have noticed a comment or two raising an important question that we’d like to briefly address here. The question is whether our suit could impair the production of hydroelectric power at Pelton-Round Butte, or even result in lost jobs as a consequence of protecting water quality and recreational fishing. So let us be clear about the operations of the Selective Water Withdrawal Tower at Round Butte Dam. The tower only changes the depth at which water is drawn from Lake Billy Chinook reservoir for power production, not the amount of water withdrawn. Tower operations have no impact on the ability to produce power at Round Butte Dam. Nor would the changes we are seeking impact power production in any way. Further, there is no reason to think any jobs would be at risk if tower operations were changed. If anything, changes in fish passage methodology (the reason the tower was constructed) would likely increase job opportunities in the region. Although surface water withdrawal has no impact on power generation, it is having an enormous impact on water quality above and below Pelton Round Butte. Through our proposed lawsuit, the DRA is working to ensure that PGE complies with the water quality requirements agreed to as part of its operating license. Once again, we want to thank everyone for their support! The feedback we’ve received in the past two weeks is inspiring and has let us know we are on the right track. Last month, Andrew Dutterer accepted a new job with the Oregon Watershed Enhancement Board (OWEB). We were disappointed to have Andrew leave his position as Executive Director here at the DRA, but are delighted that he has this opportunity. Andrew had been preparing for this job with OWEB during his time in graduate school, and had performed an internship there hoping to make this opportunity possible. We’d like to congratulate OWEB on their new hire! Andrew did a marvelous job for the DRA and we know he’ll do a great job at OWEB. Jonah Sandford has taken over as Executive Director of the DRA. Jonah accepted the position after working for us on a contract basis since last October. In that time his work for us has been exemplary, and we’re thrilled he accepted the position. Jonah graduated from the University of Montana in 2003, and went on to do post-baccalaureate studies at Oregon State University in fish ecology and ecological restoration. More recently, he earned a law degree from Lewis & Clark Law School, and is a member of the Oregon Bar. This background has prepared Jonah to lead the DRA into the future. Jonah and his wife Gwen have a three-month-old son, and we are pleased to welcome them all to the DRA family. Jonah is already filling the role of Executive Director with a great deal of competence and enthusiasm. We hope you will all join us in congratulating Jonah on his new position with us!